Good news to us who love to shop in UNIQLO! As part of their 4th Anniversary (would you believe it has been four years already?! 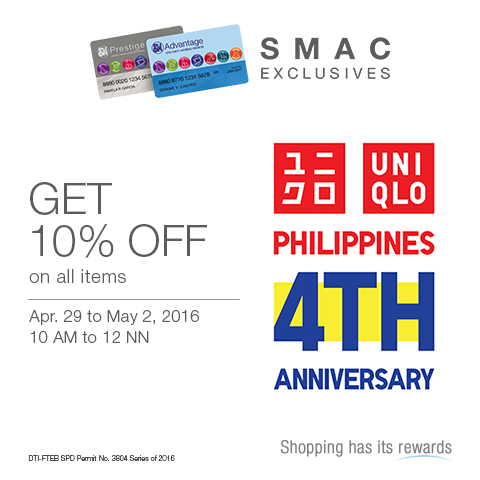 ), the brand partnered with SM Advantage Card and now gives 10% discount on all of their items from April 29 to May 2. There is still 2 more days to avail this promo so if you are in need of basics (I super love their legging pants that i wore here) our wanted to update your wardrobe (they have cool shirt collections too), visit a nearby Uniqlo Philippines shop near you. Happy shopping! Wow, this is good news!